We are happy to report that UMP's A Ver Series has taken both first and second place in the Best Arts Book category at the 12th annual International Latino Book Awards. María Brito, by Juan A. Martínez, received first place and was designated a "Triple Crown Winner" -- which means it was a unanimous vote among judges. Click here for links to downloading the foreword by Chon A. Noriega, the introduction, and an excerpt. 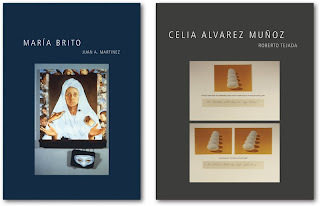 -Catch this video interview in which Tejada and Noriega discuss the life and art of Celia Alvarez Muñoz. -More about the A Ver Series. -The full list of winners at the Latino International Book Awards.